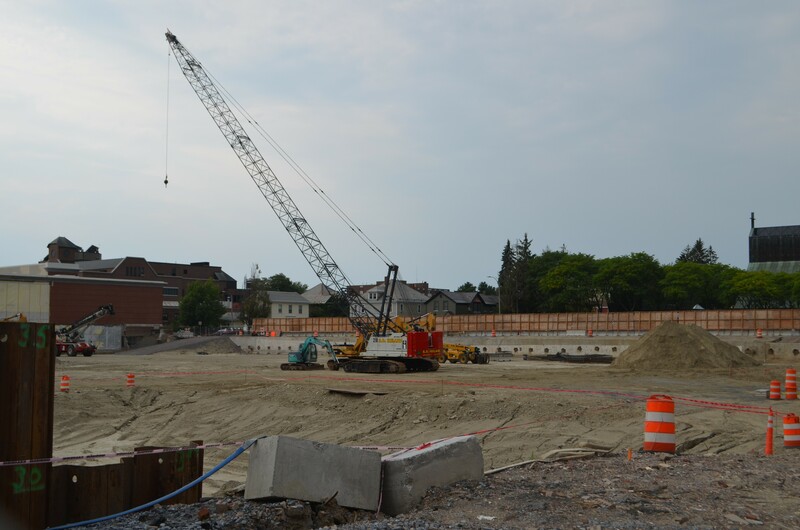 The backhoes and crane have been quiet at the site of the mostly demolished Burlington Town Center. Developer Don Sinex has lacked the construction financing necessary under a development agreement with the city to move ahead with the next step: pouring the foundation for the 14-story CityPlace Burlington. The Burlington City Council voted 8-2 Monday to alter that agreement in order to get things moving again. Mayor Miro Weinberger had requested in a letter late Friday that the council allow Sinex to build the foundation before he has a contract for the rest of the project. City councilors raised questions in interviews Monday about what the changes would mean for the project, and whether approving the changes would put the city at greater risk if the project were to fail. If Sinex ran out of money, would it be worse to have a foundation or an empty lot? And would a no vote — essentially forcing Sinex to wait to start the foundation work until he had certain legal agreements and a full construction loan — potentially delay the project and risk deals with future tenants such as the University of Vermont Medical Center? "There's a lot of things we still need answers to," said council president Kurt Wright (R-Ward 4), before Monday's meeting. Currently, Sinex has $56 million in financing, from his own pocket and from Rouse Properties. In April 2017, Sinex's group Devonwood Investors agreed to finance a portion of the project. The remainder would be financed by a roughly $200 million construction loan. Sinex hasn't yet secured that deal, according to the mayor's letter. Sinex said in April 2017 that he "was highly confident" he'd have that cash in hand the following month. Now, 16 months later, Sinex asked the city to allow him to build the foundation with his $56 million, rather than wait for that additional cash. Another hiccup: Under the previous development agreement with the city, Sinex could not proceed with foundation work until he had figured out the costs of the streets next to the building and for the building itself. Specifically, Sinex doesn't have a guaranteed maximum price contract for the public or private improvements, which would cap the amount that can be spent on the project. It's a contract that provides legal protection to the city; without it, there's the possibility that if Sinex spent more than he originally predicted the city could be held liable for the additional cost, said councilor Jane Knodell (P-Central District). Sinex attributed the delays to a tardy city design for the streets. He also said he hadn't bid out the work to contractors for construction of his own buildings. "I'll satisfy all the conditions — just probably in four months time," he said. Knodell emphasized that figuring out why Sinex is behind isn't the council's job. "For me, the question I have to figure out is: Is the city better off letting him lay the foundation or not?" That question, said Councilor Dave Hartnett (D-North District), may take time to answer. "It’s my responsibility as a city councilor to pause and take some time," he said in an interview Monday. "I don’t think a no vote puts the project in jeopardy." Hartnett voted against the measure, as did Max Tracy (P-Ward 2), who said he was "deeply concerned about the continued viability of the project." Richard Deane (D-East District) abstained. Weinberger portrayed the vote as a necessary bureaucratic step in a complicated project. Sinex and his investment partners "want permission to spend their equity building this foundation. At this point, barring something unforeseen, we should allow them to do that," he said. Weinberger said the council's involvement is holding Sinex to a high standard. "This is the development agreement working as it was intended, protecting the city, and giving the city visibility into what’s going on," he said. Sinex, too, contended that he was adhering to the development agreement, and should be granted permission to move ahead — for the benefit of both the city and his project. "Issuing the foundation permit now as opposed to later will not in any way affect the City but will enable the project to move ahead," he wrote in an email to Seven Days. The project fell behind schedule last winter after workers found asbestos in a layer of glue used for a rubber roofing membrane. Amendments to the project in March sparked a flurry of objections from the public and a citizens opposition group. The foundation work was supposed to begin in July. Sinex has also had disputes with his contract manager, South Burlington firm PC Construction. "We are aware of disagreements between PC Construction and Don Sinex, have been monitoring the situation, and have encouraged both sides to sort out their differences, if possible," Neale Lunderville, acting director of the Community and Economic Development Office, wrote in an email to Seven Days in mid-August. "We have some concern that an ongoing dispute could impact the schedule." The city council met to discuss the issues in mid-August and again Monday in executive session. Ultimately, it's Sinex's job to manage the project, Lunderville added. Jay Fayette, president of PC Construction, did not return a call for comment. The council voted to allow the city to fully take over the design of the Bank and Cherry streets portion of the project. Previously, the city managed a portion of that, and Sinex had the bulk of the responsibility. The city requested the change, Weinberger said, "to minimize the possibility of error and to make sure the city gets the streets it wants." Councilor Adam Roof (I-Ward 8) downplayed the long-term implications of this vote on the project as a whole. "There’s no indication that I’ve seen that this project is at great risk" — or, at least, no greater risk than has been present since the start, he added. This change "is reasonable within the context of the overall project, which is large," he said. "We shouldn’t be screaming that the sky is falling."